Liuying Li is a PhD student in the University’s Department of Electrical Engineering and Electronics. “I was a 2+2 student from XJTLU and came to the University of Liverpool in 2010, which means I spent two years studying at XJTLU followed by two years here in Liverpool, where I completed my BEng (Hons) degree in Electrical Engineering and Electronics in 2012. 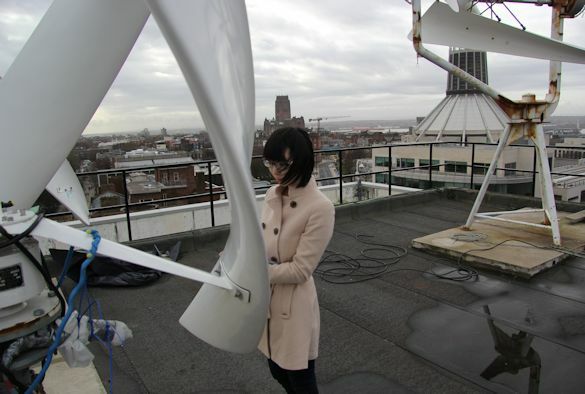 During my undergraduate study, I became very interested in renewable energy and control technologies and was therefore very fortunate when the opportunity arose for me to undertake a PhD studying the control of wind turbines. I also feel really lucky to have Dr Lin Jiang as my supervisor, as he is an expert in smart grid control and renewable energy. My PhD is an industrial led collaborative project funded by the Centre for Global Eco-innovation and a local company, Gencoa Ltd. The project aims to develop a controller to improve the efficiency of wind turbines. In recent years, wind energy has become one of the rapid growing renewable energy sources, and the company see this as an exiting opportunity to develop existing product lines, in-house knowledge and expertise into new markets. The wind power industry prefers reliable, simple control algorithms and is constantly looking for new methodologies and technology to improve the power output in industrial applications. Most people assume that when you see a wind turbine rotating, the faster it is rotating the more power it is generating. This, however, is not necessarily true. To achieve maximum efficiency the turbine needs a controller to balance the rotational speed and generated electric power. In a fixed wind velocity, a wind turbine can generate maximum power under a particular rotational speed. Thus, in natural variable wind velocity, the controller needs to control the turbine’s rotational speed to ensure the wind turbine tracks its maximum power points. Another factor that controllers need to take into account is that in different conditions, wind turbines have different control objectives. A good wind turbine controller should therefore not only maximise efficiency for a given objective and conditions, but should also enable the turbine to switch smoothly between each control objective which will in turn extend the wind turbine’s lifetime. Prior to my project, one of the main obstacles to designing efficient controllers was the huge variation in different wind turbines’ characteristics. In addition to this, their characteristics can dramatically change with time plus factors such as dirt and ice on the turbine blades will also affect performance. The ability of a controller to achieve maximum power point tracking without prior knowledge of the wind turbine characteristics was therefore one of the major focuses of my research. This has required a multifaceted approach to my research involving iterations of designing and enhancing computational modelling algorithms via simulation followed by laboratory based experimentation and ‘real-life’ hardware-in-the-loop prototype controller implementation. This has all been worth it as it has led to the design of a novel control scheme. The two vertical-axis wind turbines on the Electrical Engineering and Electronics building roof are used in my prototype experiments. You can see these rotating from much of the campus. So far, a more economic and efficient wind turbine generation system including monitoring and control equipment has been installed and tested. The experiment results show the advantages and advancement in generating efficiency of the developed controller by comparing with the turbine’s original control system. Becoming a graduate researcher in the Centre for Global Eco-innovation has enabled me to develop skills that I hope will set me in good stead in the future, when compared to a standard PhD, due to it being an industry-led collaborative project. The company’s main business is in magnetron sputtering and expertise in controller products, but before contacting CGE it had no experience in wind turbines. The initial research idea was brought to the university through Dr Matt Fulton in CGE, who matched the project to Dr Lin Jiang’s research. The idea was then developed into an academic project, while maintaining the essential commercial outputs for the company. During the past 3 years I have had opportunities to work alongside Gencoa Ltd and therefore to experience research from both The University’s academic perspective and through the eyes of a research intensive company that needs to maintain cash flow while developing innovative new products. It has encouraged me to combine theory with practice and to deliver innovation that offers benefits to the environment and commerce. I can confidently say that working with CGE has given me opportunities to obtain knowledge and skills that cannot be learnt from books. I hope to continue with my current research following completion of my PhD. One obvious potential development is to extend the current controller I’ve developed into solar power systems. I not only hope to contribute to R&D of renewable energy generation and integration but also to promote green energy in the future. Please contact Dr Matt Fulton (mfutlon@liv.ac.uk) for further details about the Centre and working with the University of Liverpool.